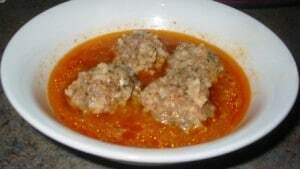 My friend Erica Danos craved her Yiayia’s Youvarlakia (Greek meatballs in tomato sauce). She tried making the dish a couple of times and was finally content with it turning out “95% like Yiayia’s”. I say that’s success! Here is Erica’s recipe for Yiayia Erato’s Youvarlakia. Heat oil in a small skillet. Saute the onion 2-3 minutes until soft then add the garlic for a minute. Next add the rice for 2-3 minutes to allow it to get coated with the mixture. Place ground beef in a medium bowl. Add the sauteed onion, garlic and rice mixture, as well as the dried herbs, beaten egg, and salt and pepper to taste. Mix together lightly and then shape into walnut shell-sized meatballs.